Bibicha Sanao pans for gold at a small mining site near the village of Metale in Ituri province, Democratic Republic of Congo. Small-scale mining is a huge source of income in many African countries, but female miners face widespread discrimination and cultural taboos. Standing barefoot in a swampy pond, Bibicha Sanao sloshes the muddy water in her basin with an expert motion, panning tenaciously until she finds the hidden treasure: a few tiny slivers of gold. It can be hazardous work. She lifts her pant leg to show the scars from a water snake's bite. Sometimes she gets sick from the contaminated water and the chilly rain. It's not much safer when she toils in a nearby gold pit, where she was once buried in a landslide. Yet, she won't give it up. Her mining work here in northeastern Congo is crucial for supporting her family, and she's been doing it for many years – despite obstacles that men never face. Now, activists are fighting to remove those barriers, giving African women a chance at the higher incomes that traditionally go to men, while improving the health and safety of their working conditions. Small-scale mining is a huge source of revenue in Africa, providing jobs for an estimated eight million workers who support 45 million family members. At least a quarter of the workers are women. And even though they are paid less than men, they earn six times more than what they receive in other work, researchers have found. Mining could be a much bigger source of financial support for African women, but women are hobbled by restrictions that range from the discriminatory to the nonsensical – including cultural taboos and superstitions that are now being challenged. Activists and civil society groups, including Canadian groups, are seeking to develop education and human-rights programs to give women a fairer chance in the mining sector. It's an example of the greater emphasis on gender issues by development experts in many countries, including Canada, where the Trudeau government has announced a "feminist" aid strategy to put women at the centre of its foreign aid policies. 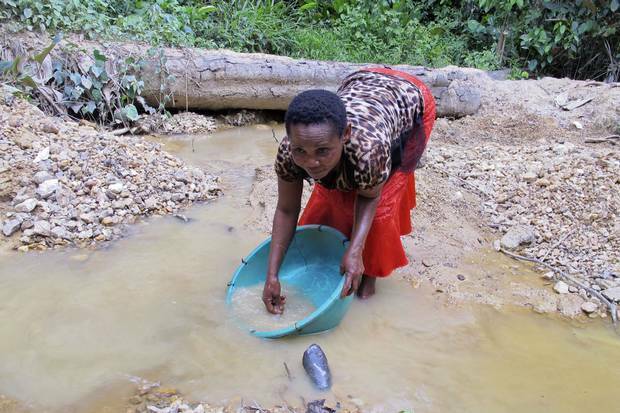 In interviews near their homes in Metale village, Ms. Sanao and other women revealed some of the irrational rules and cultural taboos that are imposed on them at the gold mines of Ituri province in the Democratic Republic of the Congo. The best-paying jobs are underground, in the tunnels and shafts, where diggers pry loose the rocks that contain gold. Yet, women are largely barred from underground work, because they are seen as "too weak" for digging. 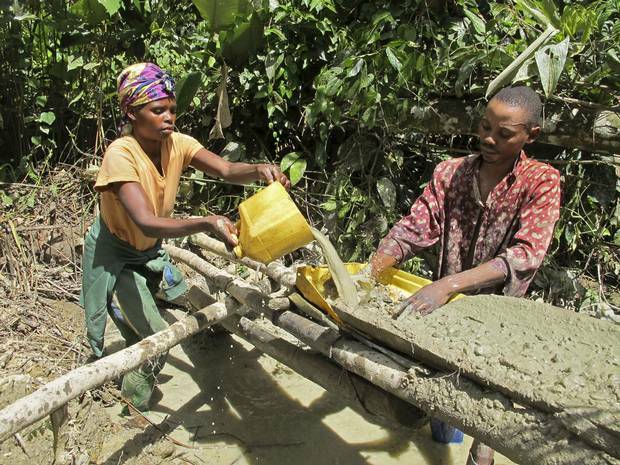 Instead they are often limited to lesser-paid tasks: pumping water, carrying rocks, or washing and grinding the rocks. In the mines around Metale village, there is an even deeper discrimination against unmarried women. They are often perceived as prostitutes or temptations to the men, and they are chased away from the mines. And the married women face barriers, too. When they are menstruating or when they become pregnant, they are forced out of the mines because of superstitious beliefs that they will "curse" the mine and bring bad luck to the miners. The result is a significant loss of income for the women. In some mines in this region, the rule is even more bizarre. When they are two months pregnant, women are banned from the mines. They are allowed back into the mines at four months, then banned again at seven months. "It's a traditional belief that they hear from their grandfathers," a local women's leader says. Some of the women themselves are convinced that the superstitions are true. They claim that their husbands won't find any gold when they are menstruating or when they are two or three months pregnant. "I've experienced it myself," insists Mami Basikawike, who has worked for six years in the mines with her husband. "Instead of finding a matchstick worth of gold as usual, we find none," she says, citing a traditional measure for the weight of small amounts of gold. She describes another rule that discriminates against women miners here. Unlike men, they must ensure that they are modestly dressed at all times. The work is strenuous and they often rip their clothes, yet they are not permitted to keep working with torn pants. "The men could criticize you or chase you away," Ms. Basikawike says. "It's not a lot of money to buy one pair of pants, but over the course of a month, it's a lot." 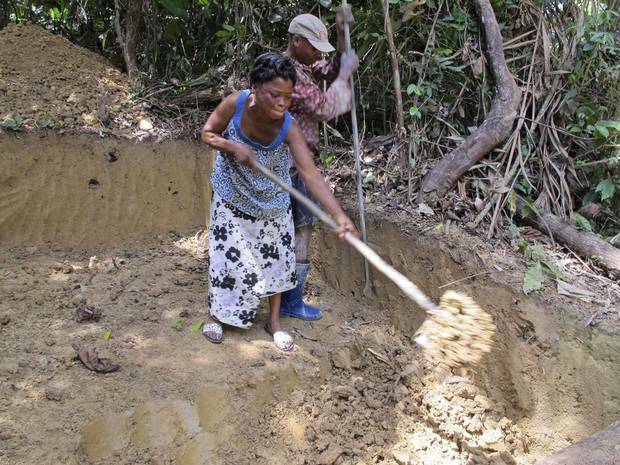 Mami Basikawike, left, and Germain Kambale dig up soil as they search for gold at a small mining site near Metale. She says female miners are subjected to a double standard by being required to dress modestly and avoid wearing ripped clothes. Denise Kavuho and her husband, Mr. Kambale, sluice for gold. Married women are barred from working at the mines when they are menstruating or pregnant because they’re believed to bring bad luck. The rules that discriminate against women are drafted by government committees in which women have no voice. When a national agreement was drafted on Congo's small-scale mining sector in 2012, the agreement included an attempted ban on mining by pregnant women – even though women were not consulted and were not present on the committee that drafted the rules. Consultations in the mining sector are routinely conducted in all-male meetings. "It's terrible – the women are never there," says Gisèle Eva Côté, a mining gender specialist at Partnership Africa Canada, an Ottawa-based civil society group with projects in Africa. In interviews for her research, women told her: "We don't have the right to speak. We have to sit at the back in the meetings, and they don't listen to us." A study by Canadian and Ugandan researchers, including a team from Carleton University, found similar issues in six mining zones in Rwanda, Uganda and Congo. They found that only 15 per cent of women held the high-paying digging jobs, while 62 per cent of men were diggers. "Almost all positions of authority over mining operations are held by men," the study concluded. Yet, it also found that 58 per cent of women miners in the survey were the main income earners in their families. Mining work can have huge benefits for women, allowing them to support their families during lean periods when farming is unproductive. Some women are even able to build up enough income from mining to diversify into businesses, the study found. To unlock the economic potential of women miners, advocates from groups such as Partnership Africa Canada are discussing a new strategy. Their plan would aim to reduce the restrictions on pregnant miners, give women a greater voice in mining policy decisions, help women miners with technical and safety training, and launch education campaigns to tackle the cultural taboos and the traditional rules that limit women to lower-paying mining roles. It will be difficult to introduce the plan in a region where the taboos have been entrenched for decades. But if it works, it could finally allow women a fair share of Africa's vast mining wealth. Trump’s aid cuts risk pushing African women ‘into the Dark Ages’ Africa’s staggering growth is fuelling a global migration crisis and keeping millions in poverty and constant pregnancy. 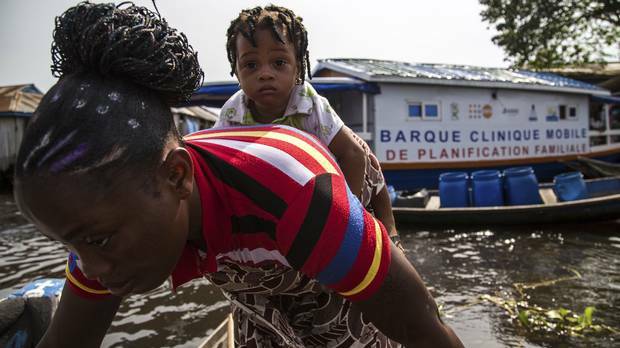 In Benin, Geoffrey York takes a look at the African women whose futures are at stake. 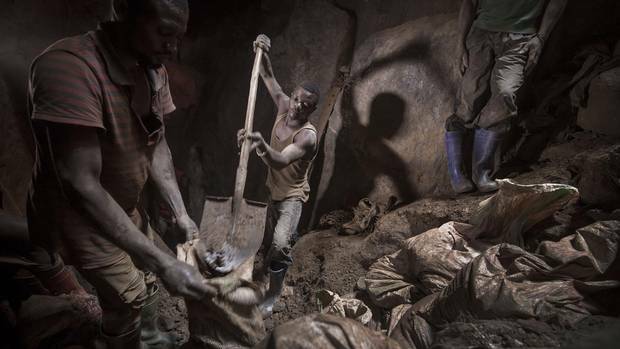 New gold standard emerges for Congo's miners, Canada's jewellery buyers Workers in the small-scale and artisanal mining industry are routinely exploited and vulnerable, but a new Canadian ethical-trade program aims to change that. 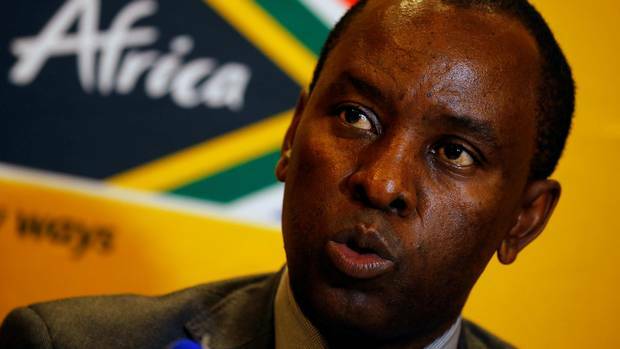 New mining rules in South Africa would require 30-per-cent black ownership In June, South Africa announced a 'revolutionary' new mining code that triggered a plunge in mining stocks and a swift threat of legal action by the industry.